Ovarian cancer is relatively uncommon but it is extremely deadly. For example, there are approximately 210,000 new cases of breast cancer every year in the United States and nearly 40,000 women die. In contrast, there are about 22,000 new cases of ovarian cancer and nearly 14,000 die. Accordingly, 19% of women die from breast cancer compared to 63% from ovarian cancer. What makes ovarian cancer so deadly is that symptoms are relatively nonspecific and unlike breast cancer, where mammography is a sensitive screening test, there is no screening test for ovarian cancer. As a result, at the time of diagnosis three fourths of women have cancer that has spread to distant sites and the 5 year survival rate is 30%. The outlook, however, is not always this dismal. For some women the survival rate is 90%. The reason for this striking difference is that ovarian cancer is not a single disease but a group of different types of cancers which present differently, have different pathologic features, different genetic characteristics and require different types of treatment. Here are two hypothetical examples. Mary is 40 years old and presented to her doctor complaining of bloating and fatigue that was present for a few months. Her mother had breast cancer and her aunt had ovarian cancer. Because of her family history, her doctor ordered a special genetic test which revealed that she carried a mutated gene (BRCA) which confers a high risk of breast and ovarian cancer. She underwent radical surgery in which all of her reproductive organs and multiple tumors outside her ovaries were removed. After surgery she received chemotherapy. She was disease free for about a year but then developed recurrent tumor requiring additional chemotherapy; she eventually died from her disease 4 years after diagnosis. The other woman is Jane who is 59 years old and was found to have a large ovarian mass on a routine gynecologic exam. She underwent surgery and had her ovaries, fallopian tubes and uterus removed. Even though the ovarian tumor was the size of a large grape fruit, she had no tumor elsewhere. She is alive and free of disease 8 years later and is considered cured. 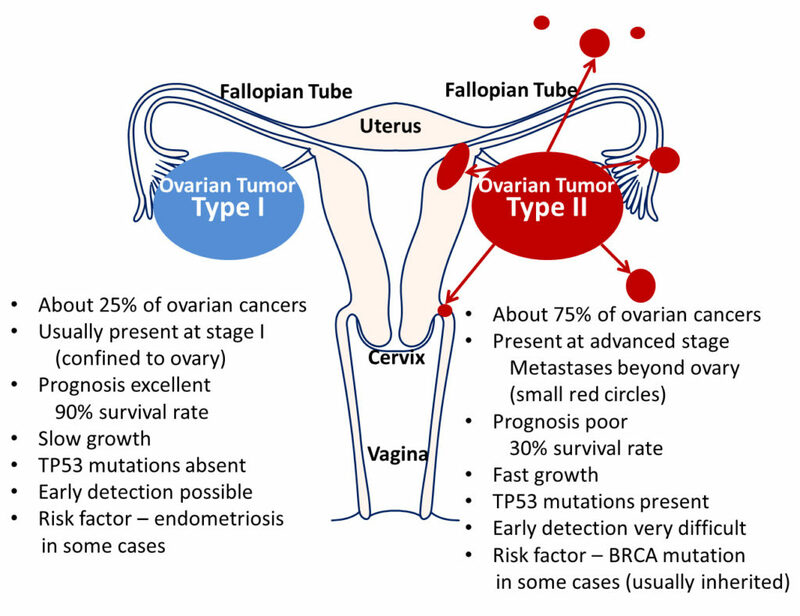 To better understand this highly complex disease we developed a model in which ovarian cancers are divided into two categories (Type I and Type II) (Fig. 1). Type I tumors make up about 25% of all ovarian cancers and account for 10% of all of the deaths. They present as large tumors typically confined to one ovary and because of their large size are easily detected on a pelvic exam. They grow very slowly and patients have an excellent prognosis. The only known risk factor for many of these tumors is endometriosis which is found in about 40-50% of cases. It should be noted, however, that only about 4% of women with endometriosis develop cancer. Type II tumors represent about 75% of all ovarian cancers and account for 90% of the deaths. Because the tumor in the ovary is relatively small they are very difficult to diagnose early and therefore they have already spread beyond the ovaries at diagnosis. The major risk factor for some of these tumors is mutation in the BRCA gene which is an inherited defect passed down from one generation to the next. The dualistic model that we proposed helps scientists in developing a better screening test, helps epidemiologists identify additional risk factors which can assist in prevention and helps cancer specialists in developing more effective methods of treatment. The Dualistic Model of Ovarian Carcinogenesis: Revisited, Revised, and Expanded.